Some older Wesley House alumni will have cause to remember the name of John Newton Davies, having at the end of their first year received a prize in his name for their achievements in Greek in the Preliminary Examination to Part II of the Theological Tripos. Few will have known much about him beyond a large photo of him displayed in the College. To many others his name will be familiar only as one among many in the list of benefactors annually commemorated. With the aid of archivists at Drew University and in the central archives of the United Methodist Church in the USA, however, a rather fuller picture can be drawn. John Newton Davies was born on 25 February 1881 in Denbigh, North Wales and graduated with a BA from the University of Wales in 1902. 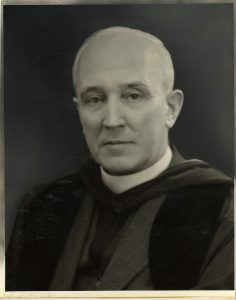 He offered for the Wesleyan ministry, probably in the same year, and was sent to Didsbury College, then in its original location in Manchester. He graduated with a BD in 1905 and served in circuits in Llandrindod Wells, Cardiff, Launceston and Rock Ferry near Birkenhead, all short-term appointments as was the rule at the time. 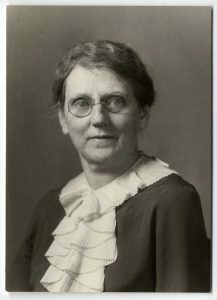 In 1909, after ordination, he married Sarah Ann Parry. She also was Welsh and had trained as a teacher. In 1919 he was invited to become a Visiting Professor in New Testament Greek Exegesis at Drew Theological Seminary in Madison, New Jersey. What brought this about is not known. Obviously he had talent. Whether he was recommended for the post by his former tutors at Didsbury, or felt frustrated by the limitations of his circuit appointments and put in an application we shall probably never know. He continued at Drew, however, for the rest of his working life. In 1926 he was made a full professor and in the same year Syracuse University conferred on him the degree of Doctor of Sacred Theology. At first the Wesleyan Conference in Britain listed him as ‘permitted to serve’, but in 1927 he transferred to what was then the Methodist Episcopal Church in the USA. He retained membership of the New York Annual Conference until his death, although he returned to Britain after retirement in 1949 and lived in Bournemouth where he died on 31 January 1957. From the surviving records he was clearly a much loved and respected New Testament teacher. Tributes to him speak warmly of his meticulous scholarship and his ability as an interpreter to make the text come alive. There are tributes too to his preaching and to the hospitality he and Sarah offered in their home. He published little by modern standards. Rightly Dividing the Word in 1929 was his only book, although he contributed to the Abingdon Bible Commentary and various religious periodicals. At the end of 1959 Mrs Sarah Davies set up a trust fund of £6,000 in his name for the benefit of Wesley House, to be used at the Trustees’ discretion. Originally used for prizes and other awards, it is now, with changing values and needs, to be devoted to the support for one year of the Holiness Journal. His name will live on in the annual commemoration of the College’s benefactors.